Building a website takes more than just content and general design. There has to be a mix of a personable touch and direct demonstration the most crucial information. A website is among the most important forms of representation for your company. There are many factors to consider when choosing your logo and layout, but the most crucial is making a good first impression. Some companies have identifying colors that become staples in the public’s mind. For example, think about the blue logos for companies such as Facebook, Geico or Walmart… Or red logos for Toyota, Coca Cola and Target. Now notice the color schemes of their website in relation to their logo. On websites of some of the most successfully-branded companies, you will notice a pattern of logos matching the overall color schemes of the site. It is key to building continuity of brand identity. Thus, this is an aspect that should never be taken lightly. In many cases, you should seek the services of professionals in branding and logo design. Websites Depot puts an emphasis on finding the right formula of high-end coding and web development to go along with appealing visual design that makes an impression. There is no cookie-cutter approach– we take time to learn the identifying-factors of each client’s business. We have a team of experts who specialize in specific areas of web development and know how to get down to the fine details. 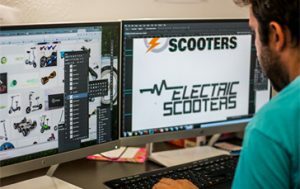 Our team of professionals keeps our clients involved in the process of site creation, especially with logos and graphics. We can provide you with creative guidance or recreate your vision. Our team of graphic designers have many years of collective experience in brand-building as well as website and logo design. When you contact Websites Depot, we get to know your business and your personal taste to find the right direction. The process is very-much a two-way- street in which we get your feedback the whole way through. Our designers are happy to share multiple versions of graphics to those we work with during web development. Our clients choose their favorite, and keep the others compliments of us. Our team’s expertise and experience puts us at the forefront of the industry. What sets us apart is our willingness to roll our sleeves up and talk to our clients about their vision for their site and their business. We’ve worked with businesses large and small. At the end of our project, we will make sure you are fully satisfied with the finished product. We offer multiple design packages to fit your particular needs. Get in contact with us with any questions you may have.